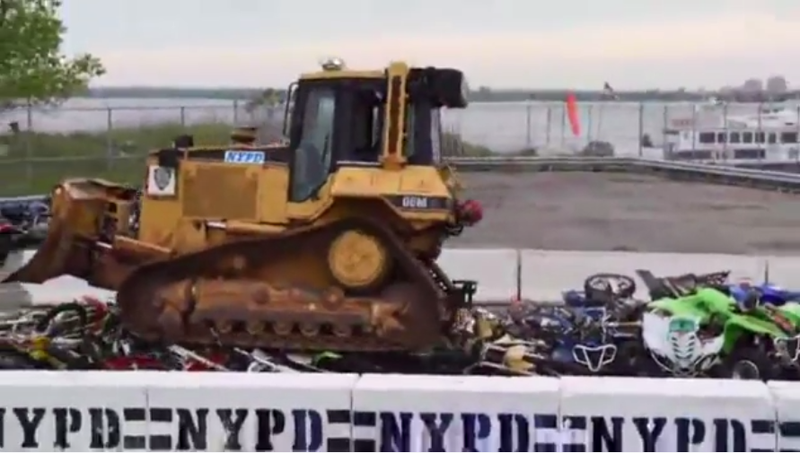 The City of New York just live-streamed their police crushing a parking lot’s worth of unlicensed dirt bikes and ATVs. The vehicles were presumably confiscated from hooligans who’d been caught using them to do stunts in streets. Anybody feel better now? “Mayor Bill de Blasio and NYPD Commissioner Bratton have said repeatedly if you put an illegal all-terrain vehicle, motorbike or scooter on a New York City street, it will be confiscated and one day destroyed,” city officials said in the stream, which you can watch below if you hate yourself. The interpretation the authorities are hoping for, I think, is that The Man won’t tolerate misbehavior and will take your toys if you don’t listen to daddy. “Crimes have consequences” is probably how the press release will word it. Unfortunately, the motorcycles that were publicly executed didn’t commit any crimes, the alleged criminals caught riding them probably weren’t watching, and even if they were, how many of them arrived at “From now on I will be obey the law!” after seeing this? “Just another example of old white guys taking things from the poor,” was another. Public executions are provocative. That was obviously de Blasio and Bratton’s intention. Which is the most frustrating thing about this whole stunt, other than the destruction of the machines themselves; it’s escalation for its own sake. I don’t necessarily disagree with vehicle confiscation as a punishment for vehicular crimes, but if authorities want respect they need lead by example. This is nothing but an example of sore winning. If the NYPD wants to be seen as a bully, they sure did a good job locking that look down today.